This is the preferred method for assigning risks to complex projects as it allows you to quickly assign risks to multiple tasks or resources. On the Risks tab, click the Drag’N’Drop Risk view. You must indicate whether you are assigning the risk to Tasks or Resources using the options below the list of tasks or resources. Select Task or Resources and the right pane will list change based on your selection. By default the view is set to Tasks. Select tasks or resources your risk will be assigned to. Drag risk onto the tasks or resources. 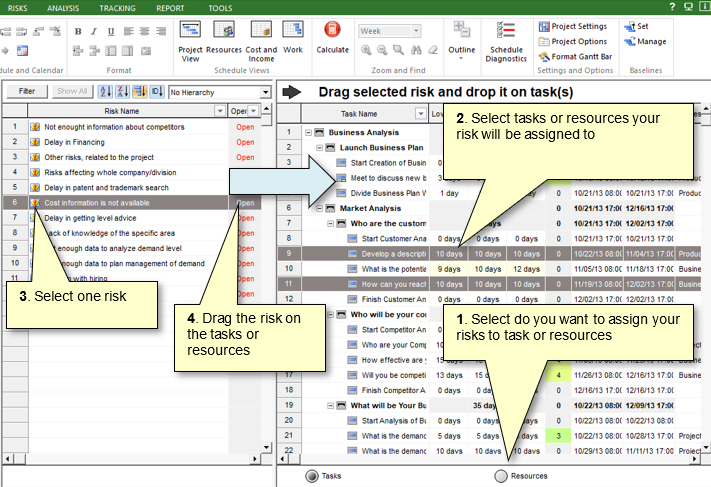 The Assign risk to task or resource dialog box opens. It shows a list of the task or resources that the risk will be assigned to and allows you to define risk chance, outcome type, outcome, and moment of risk. Enter the risk chance, outcome type, outcome and moment of risk. These parameters will be the same for all selected tasks. Click OK. The risk assignment to the selected tasks or resources is updated.